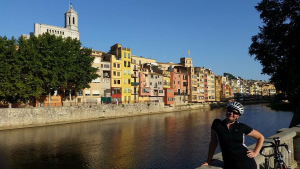 Just last week ago I spent some time cycling from the historic Spanish town of Girona. We based ourself there for a week in a city that is home to several pro riders over the winter months. I’m an ‘English Rose’, or so I tell myself! This meaning I wilt a little sometimes in the heat, and with temperatures reaching 38 degrees this did add an additional challenge to riding here in August. With temperatures like this, you can only get out early in the morning, which itself can be difficult on holiday! Also it goes without saying to drink lots of water. We also had no choice but to ride at a steady pace. 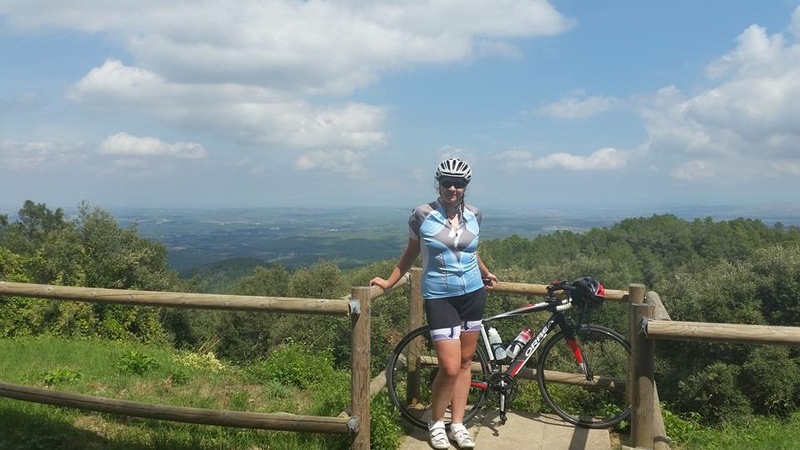 I knew I was going to be cycling for several days and wanted to enjoy it and also enjoy seeing all of the beautiful places. Girona offers excellent cycling in the areas surrounding the city. I came away feeling like I have much ‘unfinished business’ there in that there was so much I didn’t get chance to explore. 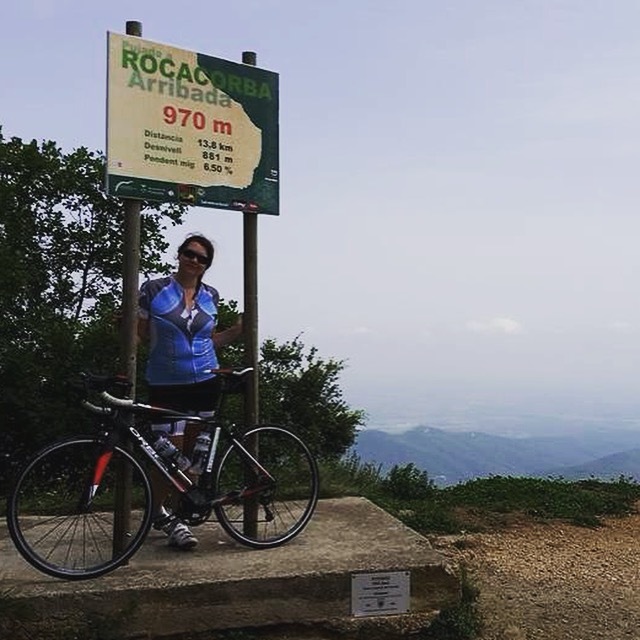 The area offers many lovely gradual climbs, as well as some more challenging climbs, Rocacorba for example. I have so many highlights from the trip its difficult to even know where to begin. This was a route that I managed to find posted online here when researching the area and some of the routes and climbs that were around. Lance Armstrong is one of many pro cyclists who have lived or live in the area. in fact most of the cyclists I saw out on the roads in Girona looked very pro! I loved this route, and we rode it on my 29th birthday. Its a 36km route with two lovely climbs – Els Angels (1129ft, 4% average) and then further on Santa Pellaia (785ft, 4%). At the top of Els Angels there is a historic monastery with a cafe / restaurant and the views walking around the building make the work climbing up well worth it. Its just a really nice route. We stopped at spent some time here, enjoy the views and take photos. If you are wanting to sight see a little too- then I strongly recommend going into the tiny village of Monells which can be found after the Els angels climb and descent. You could so easily pass this by, but we needed to stop for water and found this hidden treasure. A totally unspoilt historic square, off the beaten track and unspoilt by tourism. It felt quite special to stumble across somewhere so nice. 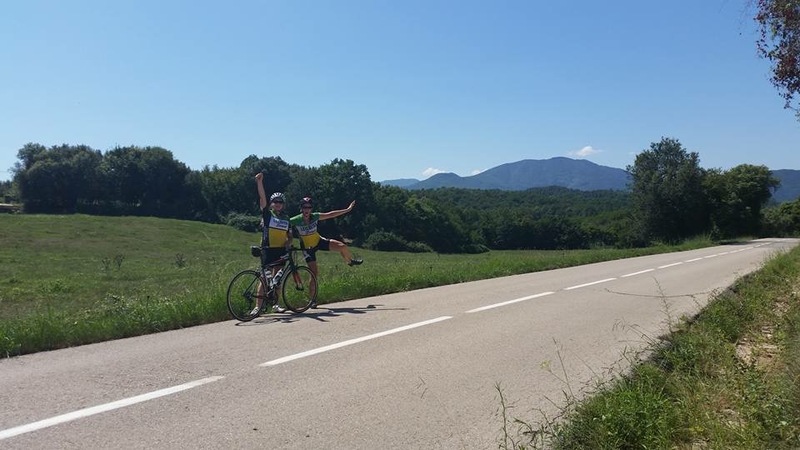 We rode out of Girona, and found a nice climb over the mountains. 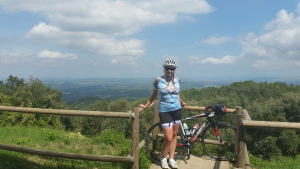 The climb name on Strava is ‘Sant Grau’ (1126ft, 4%), but then we hit the most amazing descent. No photos can describe quite how amazing it was! Hairpin bends, views over the whole descent and the coast and it just kept on coming and coming all the way to the coast. We then hit the coastal road and road along to Tossa De Mar and stopped for a little lunch. This is the day I very nearly wilted. I have never ‘bonked’ before, but was close to being pretty exhausted mostly from the heat! With it being so hot I hadn’t wanted to eat much, and I think this showed on this day! I didn’t know how I was going to make it back, knowing we had a cat 3 climb just to be getting on our way! Well as usual when your feeling tired the uphill kept on and on and on, but again as usual you can carry on for a lot longer than you think. A route well worth it, because its beautiful! 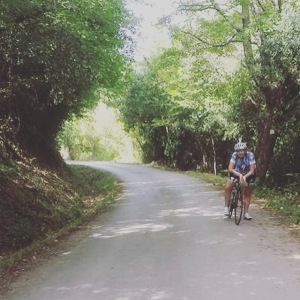 The beauty of this area is that you can ride and find climbs that are so gradual that you don’t even know your going uphill. At one point I realised that without pedalling I was being blown up hill. It didn’t even feel windy, but it was such a steady ‘false flat’. We met some cyclists at our hotel, and bumped into them a couple of times. They told us about Rocacorba, and I had read about this climb too. 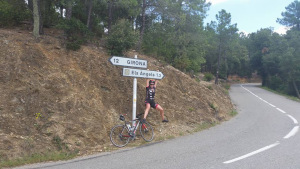 Well when Annie hears about such a climb thats it she wants to do it, I would always be up for giving it a go, but this fell on the very last day of cycling. It was going to be the biggest climb I had done, and it looked like it was going to be done on tired legs too! 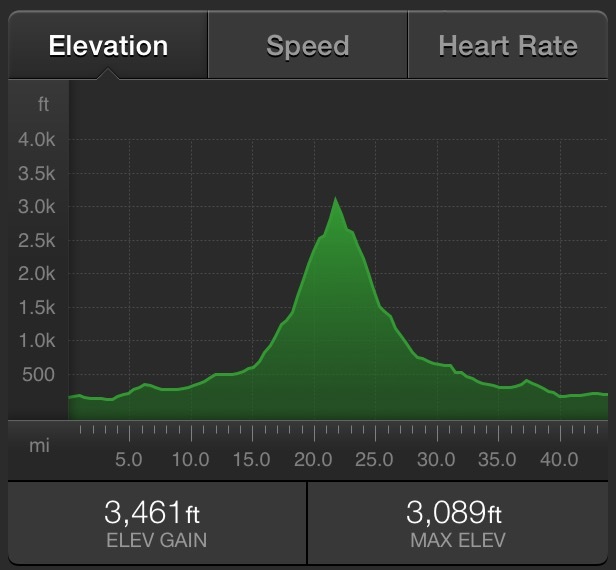 The climb profile is 3267ft over 8.5 miles and an average gradient of 6.5%. I may have crawled up at a snails pace and also taken a few stops, for photos of course but I made it. The gradient starts off nice and steady, but then kicks up to between 8 and sometimes 15%. 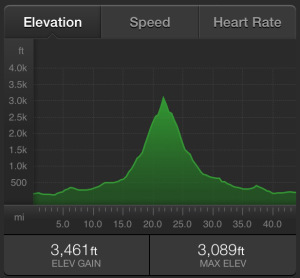 Im not a natural climber over that gradient and distance with a climb, but the plan was just to get up. Its a one way track up and down, just a road to test yourself! I asked myself why I was doing this at the time, I also told myself as I have done on countless occasions when the going gets tough that this is the last time I’m putting myself through this ever! As usual the view was well worth it. The hard work is always worth it. We stayed at the top for a while and took in the misty mountainous view. Worth the hard work in the end! I love it here. Its a beautiful natural lake, there is something lovely about being by water. 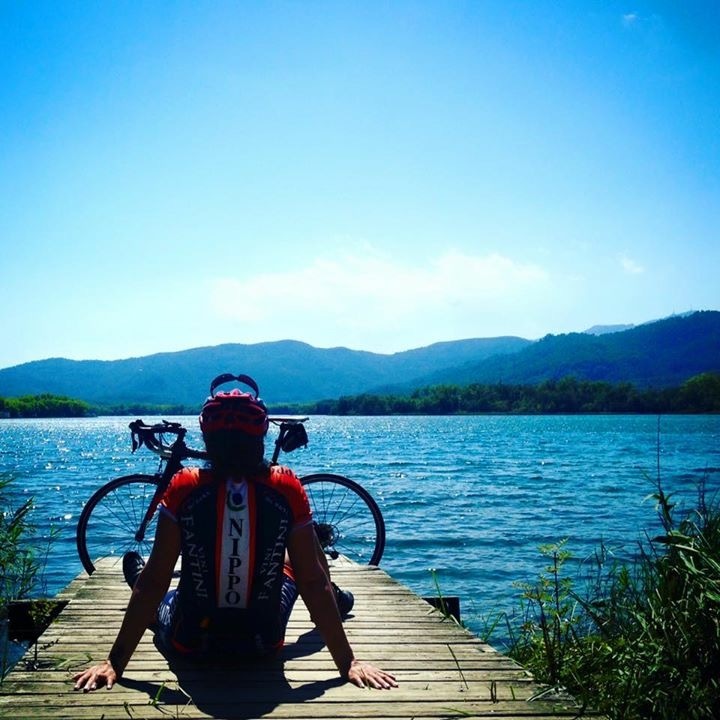 After climbing Rocacorba we came and found a nice bar along the lake side to enjoy the view and relax after a good weeks cycling. There is a cycle path all the way around the outside, its for steady riding but its beautiful. I have a lot of love for Girona as a city. A beautiful walled old town, with lovely cobbled streets. A return visit will be on the cards for sure, just maybe at a cooler time of year!